Just after Barack Obama was elected president, I ran across a group called Kitchen Gardeners International. They had created a campaign called Eat The View that was petitioning the president elect to replace the front lawn of the white house with a kitchen garden. The Garden of Eatin': A Short History of America's Garden from roger doiron on Vimeo. Of course I signed their petition and put myself on their (e)mailing list. 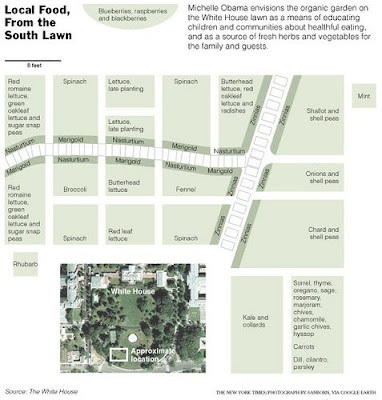 And just yesterday I received an email from KGI announcing that the Obamas will actually be putting in a garden. I'm not even sure exactly why it is that this makes me so very happy. * The title was borrowed from another video at the Eat The View site. YES! I was so excited when I got my email this morning, I read it before anything else. So amazing! And it's not even, like, a shrimpy size garden or anything - 1100 square feet! That's bigger than my house! Anyway - so awesome. Although I feel I should warn them against planting so much Evil Chard. Not to mention kale and collards. Yarf. That stuff gets old fast. Yay! They keep on doing everything right. I love it! It is huge too. We're going to grow some more edibles this year - though we have no yard - will be in containers. Fun! Finny, maybe you should send them a note of warning about all those greens. Kidletsmum, I think I'm so excited because I totally didn't expect that they would actually do it. I told a friend who gardens organically and her exact words were, "No Way!" I posted this video on my blog in January. I love it so. Yesterday I also posted a picture of Michelle Obama shoveling up some turf. It's a happy, happy thing to have people in the oval office who feel the immediacy of setting this example. -They are good, hardworking, normal people...even if they are in the White House. -They are not above every-day Americans, they are with us. It feels SO good to be American now, even though I have to listen to all the financial nay-sayers where I work.